You Want Listings, We Want Rentals. We partner with only the nation’s most qualified Realtors and Real Estate Agents as part of a best-in-class, mutually beneficial Agent referral program. 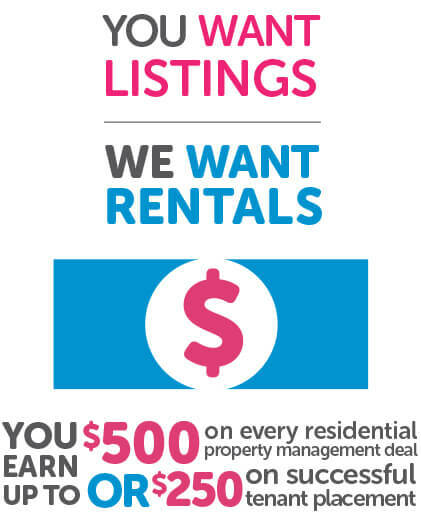 Agents can earn up to $500 on each property management referral. * Renters Warehouse is a full-service real estate investment services company that values our relationship with real estate agents throughout the nation. We will always refer an owner back to an agent if they decide to sell. If for any reason a referred owner decides to use our marketplace to sell their investment property, we will pay a referral back to that agent. Click here to read our guidebook “Rent Estate for Real Estate Agents” to discover the increasing demand for single-family rentals among property investors, and how you can work with Renters Warehouse to serve this increasingly significant portion of homebuyers. Note: This program is not available in all Renters Warehouse markets and subject to change. Please contact your local Rent Estate Advisor for more details. 1) Submit your contact and referral information and we will add you as a qualified Agent in our Preferred Agent network. 2) Preferred Agents can earn up to a $500 commission per new management contract*. 3) Or earn $250 on a successful tenant placement.